It used to be the moment I woke, the awareness of our Lord’s presence abounded. Immediately I would speak to Him in prayer. I had a smile always on my face. It was the so wonderful “honeymoon” of faith. Joy filled my heart, and just before waking, I could hear His voice calling me to wake. Lately, I seem to be losing the awareness and my thoughts have become rather distorted with “worldly” things and souls. I have been struggling upon waking for the past few weeks, and have noticed the strange distractions of other things, taking the place of Him. I’m not sure why, but I am aware of this taking place and I am fighting it. I can see it for what it is, and I begin to pray the moment the distractions try to overpower me. Jesus, I trust in You, Lord have mercy on me. The awareness is not completely gone, but more like something is trying to come between us to take my attention. Imagine being on a date, and someone coming up to your table and interrupting the private conversation. That is how I can see this distraction. Earlier tonight, I had posted this with a prayer request for me, as I see my struggle and also know it to be pure grace to see it. I took my girls out for ice cream tonight. On the way home, there was so much water on the street but it was as if someone was driving in front of me while dumping out a pitcher of water. It soaked the entire lane we were in and it had made its own river flowing onto the freeway. This huge “river” went from the ice cream shop parking lot where we had been, on to the freeway where we needed to go, flowed through and down the exit ramp to our street, through an intersection, where we made a left hand turn and up to our street. It was a HUGE water truck letting out water as it went and we were only a minute or so following behind it. Just after Evening prayers, our Lord reminded me of that spiritual dryness I had asked for prayers about and I laughed with Him. It’s so good to hear His voice. Like that water truck, spraying, He waters my soul and dismay is washed away. Lord be with us, as we are trying to be with You this lent. That we may come to rise with You on the third day. Our Lord is in the Holy Mass in “Word”, scripture, “Blood & Flesh” in the Eucharist and Spirit, through the Holy Spirit – St. Augustine taught us, “what the soul is to man’s body, the Holy Spirit is to the Body of Christ, which is the Church. The Holy Spirit does in the whole Church what the soul does in the members of the one body.” We can’t “Escape” Him anywhere we go, why would it matter which way the Priest is facing while celebrating Holy Mass? Would our Lord not “show up” all of a sudden because of the position the Priest is facing? LORD, you know it all. far too lofty for me to reach. From your presence, where can I flee? if I lie down in Sheol, there you are. and night shines as the day. Our Lord is with us always. There is no escape. If in all our ways we can not escape Him, why would anyone think for a second He would leave us in His Sacrament because the Priest is facing a different direction or is not speaking in Latin? The Church teaches that the priest ministers in persona Christi, in the person of Christ. In speaking to his disciples, Jesus said, “He who hears you hears me, and he who rejects you rejects me” (Lk 10:16). “Receive the Holy Spirit. If you forgive the sins of any, they are forgiven; if you retain the sins of any, they are retained” (Jn 20:22–23). Did our Lord turn His back on the Apostles while preaching to them or during the Last Supper? Of course not. 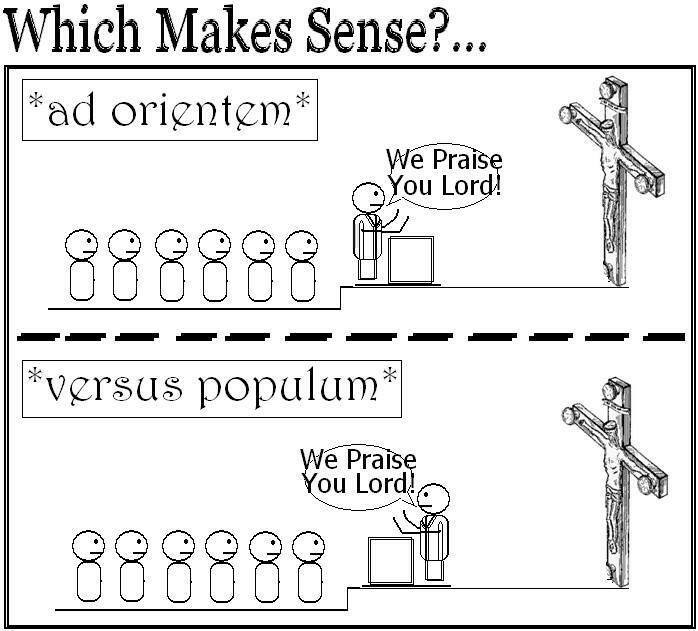 (I don’t mean this in regards to what many may say is the reason the priest turning his back on the congregation as originally, the Priest is facing East and leading the way to our Lord) We are surrounded at Holy Mass by our Lord therefore when we look past the “distractions” we have in our own ideas, we can focus once again on the Face of our Lord. Thus I believe the reason our Lord is truly present in both forms of the Holy Mass. Because He said so, and it gives us time to “overcome” that which distracts us and pulls our attention away from our Lord to grow in understanding that it’s not the “Church” that is broken and as so many say in “shambles” because of this, but we who are because we “choose” to allow the “distractions” of our own, to pull us away from our Lord. Both forms should make sense..